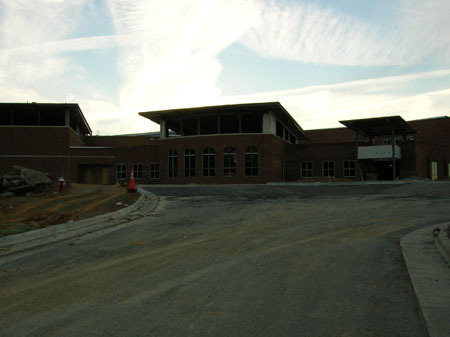 The new high school, built off Rock Haven Road, cost $35 million to build. Chapel Hill-Carrboro City Schools saw the need to relieve crowding at Chapel Hill and East Chapel Hill High Schools and to create a balance in distance among the schools in the district. The location of the school isn’t the only part of planning that got a response from the community. Naming the third high school proved difficult. These two qualities, however, were the two that supporters cited for naming it Carrboro High School. “Many supporters (of the second name) also contend that community pride is on the line as Carrboro seeks to grow its name recognition and reputation,” the memo reported. The School Board decided on Carrboro High School in January 2006, but not after a handful of less-than-usual suggestions. Among them were Dean Smith High School, Ronald Reagan High School, Robert E. Lee High School, Carrboro Tie Dye High School and James Brown Funk Spirit High School. Someone even a suggestion to name it after the superintendent. “I think it only got one vote,” Pedersen said, laughing. With the name decided, the next hurdle dealt with the student assignment plan. As with any high school opening, controversy surrounded the rising senior class and the students’ ability to stay at their respective high schools for their last year. Several plans were suggested, but on Oct. 19 the School Board approved a plan that allows seniors to be graduated from their current high schools. The plan also allows junior siblings of rising seniors to remain at their current high school for both the junior and senior years. Under this plan, there will be no Carrboro High School class of 2008. With the building nearing completion and assignments done, a majority of the planning now shifts to Thomas, who served as assistant principal of Chapel Hill High School for five years. He said he is excited about the opportunity. He first assembled a “design team” of seven teachers from various academic departments, students from the existing high schools, parents and a guidance counselor, all of whom will design and help implement programs at the high school. He also said the school will run two new programs not seen in the other district high schools: an Academy of International Studies and a Freshman Academy. Thomas based the Academy of International Studies on a program at Montgomery Blair High School in Silver Springs, Md. Through the program, students start taking courses in the Academy during their freshman year. They would then take the “Introduction to International Studies” course as sophomores, two related electives as juniors and two more courses as seniors. His main concern, however, is attracting minority students to the program. The Freshman Academy is also an academic experiment and one that Thomas hopes will make the transition for freshman students much easier. The school will work closely with the middle schools that feed into it in order to make sure students are as successful as possible. Thomas also said that he wants every student to participate in at least one co-curricular activity. But the most cutting edge aspect of the school is its size. The school is built to accommodate only 800 students, much fewer than the other schools in the district. He also said that parents want their kids to attend Carrboro High School for the smaller, more personal learning environment. Some parents and students have expressed concerns about athletics, a staple of high school life. According to the school’s Website, Carrboro High School will be part of the 2-A conference. Conference assignment is based on enrollment, according to the N.C. High School Athletic Association. Athletic fields will be available, as well as practice fields at Lincoln Center off Merritt Mill Road. But there won’t be a football stadium, which was part of a compromise reached with the residents of the neighborhoods surrounding the school. Instead, there will be a competitive field with a track and bleachers but no press box. Thomas said that this was done to keep noise levels down, but he does not expect it to detract from the school’s athletic program. “We’re still going to offer a variety of sports for our students,” he said. But what are sports teams without a mascot and colors? Thomas said that this decision is still in the works. He charged each student on his design team to come up with three suggestions for a mascot and colors. The parameters were that the mascot can’t involve warriors, Indians or any mascot used in their conference or the school district. The same goes for the colors. He said that suggestions have been made to keep the mascot within the feline family – Chapel Hill High School is home to the Tigers, and East Chapel Hill High School is home to the Wildcats. But the decision won’t be made for a while. Once all the suggestions have been collected from the design team and from suggestion boxes in the existing schools, the future students and staff of Carrboro High School will vote. “The mascot and colors are important because it’s the beginning of giving the school its identification and sense of pride,” Thomas said. This identification and pride, he said, also carries over to the town. Good work, Taylor! Very informative. Can’t wait to see the new school in person. Thanks for the links to the CHS virtual tour. I was hoping for the school to be named the James Brown Funk Spirit High School. The school team would def be the JBs. I am glad the Commons still covers Latino issues in the community!